What follows is the text of a sermon I preached on 16th July 2017 at All Saints’ Church, Lindfield, West Sussex. What is the link between Clint Eastwood, George W Bush and Eminem? They’ve all referenced Psalm 23 in their work – in a film, in a speech and in a song respectively. These aren’t the only well-known figures who have quoted from Psalm 23. Coolio, Tupac and Kanye West have all included words from this Psalm in their songs, as have Fall Out Boy, Jay-Z, Hollywood Undead, Megadeth, Marilyn Manson, U2, Pink Floyd, The Moody Blues and Duke Ellington amongst many others. It’s been set to music by Johann Sebastian Bach, Leonard Bernstein, Franz Schubert, Ralph Vaughn Williams to name just a few. The Psalm was read in the film Titanic and at Whitney Houston’s memorial service. Clearly there’s something about this Psalm that resonates through the ages and with people of all faiths or of no faith. It’s certainly one of the best-known texts in the Bible. But how well do we really know this Psalm? There’s a danger with well-known texts that, precisely because we know them so well we cease to reflect on the words and the meaning behind them. Thirdly, God guides and protects us. On to our first point, then, God provides for us. I’m no fan of shopping. I tried to avoid it as much as I can. Sometimes I feel inspired, however, and brave the shops. Within minutes of arriving however, I feel like I lose the will to live, and end up retreating into Costa for a caramel latte. I think that’s one of the reasons why I love online shopping. Even here I’ve been let down a couple of times recently. I ordered some goggles recently from Wiggle with next day delivery, and it took them an age to turn up. Similarly, I ordered some T-shirts from Fat Face, also with next day delivery, and they eventually arrived several days later. First world problems, I know, but I did find the experience infuriating. Luckily, David knew that he had a much more reliable source than Wiggle or Fat Face to provide him with all his needs. In Psalm 23 he makes it clear that he trusts God completely to provide him with all his needs. As the shepherd of his father’s flock, David knew that the most crucial role of a shepherd is to provide for his sheep. Without their shepherd, David’s sheep would have died. David understood that God fulfils the same role for his people. David trusted God to take care of all of his needs. Living in a materialistic society it is not easy for us to echo David’s words and proclaim “I shall not want.” We are surrounded by so much stuff, and see other people with so many things, that there is always something that we want. There is, however, a crucial difference between what we need and what we want. We might want a better car, a bigger house and a more exotic holiday, but do we really need these things? Of course we don’t. But God provides for us according to our needs, not according to our greed. David understands that God is not a miserly provider, but the most generous benefactor. It was common at this time for a host to anoint a distinguished guest’s head with oil on arrival at their home. David knew that, despite his lowly position, each day of his life he is treated by God as an honoured guest, his head anointed personally by his Lord. David follows this up by saying that the cup his Lord gives him is overflowing. Here’s an image of the abundant generosity of God. God holds nothing back from his people but graciously provides us with all that we need – and more. His goodness literally overflows. David understands that God bestows good things on him all day, every day. Not a day goes by when God does not provide for David in abundance. Similarly, David understands that he is never separated from God’s mercy. If we understand that God’s goodness and mercy follows us all day, every day, then we have every reason to be thankful. Why not take the opportunity for a few minutes each day to think about all the good things that God has given you? If we consciously adopt a more thankful attitude then the world will seem a much more pleasant place. Our gratitude will be apparent to all whom we encounter too, serving as an amazing witness. On to our second point, God restores us. I’ve just had a lovely week. The school where I teach has the builders in and so we were forced to finish early for the summer holidays. Consequently I’ve spent the last week on the beach with my wife, Claire, and children, Daniel and Lily. We’ve had a lovely time, and I feel well rested. A good rest was exactly what I needed after an incredibly busy and stressful term at school. I have no doubt that I’m not the only one here who often finds life just too fast paced. Many of us have lifestyles that are often very busy. Whether we spend our day preparing for exams, looking after our families, or working every hour under the sun, it sometimes feels like we simply do not have the time to rest. In Psalm 23, David presents us with a vision of peace. David says in verse three that God makes him lie down in green pastures, and leads him beside quiet waters. David knew when shepherding his father’s flock that he needed to ensure that he gave his sheep time to rest. Without sufficient rest, David knew his sheep would become stressed and distressed, which could have a serious impact on their health, and the health of the wider flock. David understood that his shepherd, the Lord, looked out for him in a similar way, ensuring that he found sufficient time to rest and recover from the busyness of his own life. If like David we make God the shepherd of our lives, if we dedicate our lives to following him as our shepherd, we can have the same confidence that God will show us peace. The rest that David knew he received from God was not limited to just physical and mental rest. David trusted that God would provide him with spiritual rest that “restores his soul,” as he wrote in verse 3. This is the kind of peace that can only be found through knowing God. Augustine famously wrote, “you have made us for yourself, and our hearts are rest-less till they find their rest in you.” He, like David, knew that true rest can only be found through a relationship with God. If we want to find true peace, then that can be found only in one place – through a relationship with God. True peace only comes from loving and knowing Jesus as a friend and as our saviour. Jesus promised this kind of rest to his followers when he said “come to me, all who are weary and burdened, and I will give you rest. Take my yoke upon you and learn from me, for I am gentle and humble in heart, and you will find rest for your souls.” This is recorded in chapter 11 of Matthew’s Gospel. It’s interesting the wording that David uses in verse 2. He doesn’t say that God occasionally suggests that he might like to take a break, or even that God tells him to take a break. No, he says that God makes him lie down in green pastures. David implies that God is active in making him take a break. Perhaps there are times when God intervenes in our lives in order to make us stop. If we wish to join David in declaring that the Lord is our shepherd, perhaps we should reflect on this element of the Psalm. Perhaps we should consciously find opportunities to take rest in order that we might better understand the peace of God. Ultimately we have to trust in God’s goodness as our shepherd, not in our own strength. Let’s move on to our third point, which is, that God guides and protects us. I’m a big fan of Sat-Navs. I’m just about old enough to remember big, old fashioned road atlases. When I first learnt to drive, if I was going on a long journey I used to consult the road atlas in advance, and then write out road numbers and junction numbers on Post-It notes to fix to the dashboard of my car. Sat-Navs have certainly made life much easier. They can sometimes go wrong, though. When I was on a driving holiday in Arizona with my friend Clive we had two Sat-Navs running just to ensure we didn’t get lost. But somehow we still ended up completely stranded in the middle of a desert. We drove past those rather creepy swinging signs you sometimes see used to illustrate impending disaster in films. We passed road signs that had been shot to pieces. Then we eventually got our big four by four stuck firmly into deep sand. It turned out that both of our Sat-Navs were pretty useless! This final part of the verse, “for his name’s sake,” is very important. David understood that the right paths through the journey of his life were those that bring glory to God. We can learn a great deal from David here. Sometimes, all we want in life is direction. It can be a real struggle at times to know which way we should head in life, particularly when we reflect on potentially life changing decisions. Where should we live? Who should we marry? Which job should we take? If we put our trust in God as our shepherd, we should strive to put him at the heart of everything that we do in life. Our key priorities should be to love God, to love ourselves, and to love our neighbours, since these are what Jesus described as the greatest commandments. If we factor these into the decisions that we make, as well as dwelling on God’s word, and spending time in prayer, then God will provide us with the direction that we so desperately seek. David says that God guides him along the right paths, and Jesus says that he IS the way. Jesus is the good shepherd who leads his followers along the right paths. He turns our meaningless meanderings into straight paths that lead directly to a place with God in heaven. For David, it is an inevitability that at some point his life journey will take dark turns. He does not say, “if” I walk through the darkest valley, but “even though” I walk through the darkest valley. He knows for certain that, even if he is following God, life will sometimes take a dark turn. In our busy, stressful world, it is almost inevitable that at some point in our lives we will all feel as if we have been thrust into our own dark valley. The particular valley we find ourselves in might be caused by something entirely different, but the result is often similar – we feel as if life is dark, depressing, and uncomfortable. David experienced this darkness himself on many occasions. You only need to flick through the book of psalms to see that David often experienced severe low points in his life. Even Jesus experienced darkness in his life. He spent forty days and forty nights in the wilderness, being tempted by the devil. He experienced loss, when Lazarus, a close friend, died. And of course, he experienced real darkness in the Garden of Gethsemane, when confronted by the enormity of his circumstances, and particularly on the cross when he died a humiliating and painful death. If we trust God as our shepherd, we need never fear anything that life might throw at us, because he will never abandon us. He remains with us at all times, whether we find ourselves in a period of great joy, a period of great sadness, or a low period of depression. Just as a shepherd would never abandon or turn his back on his sheep, our faithful God will never leave us. Of course, it is precisely when we hit those dark periods of life that we might feel utterly abandoned; by our friends, by our families, even by God. Yet David is absolutely clear that God is always with him. Scripture is clear that God will never abandon us. We might need the support of our brothers and sisters in Christ, to help us to see this, but God will never abandon us, he doesn’t ever abandon us, he is always with us. God has promised never to leave us or forsake us. God is also fully equipped to protect and guide us. The shepherd in the Psalm has a rod which he uses to deal with any threats that the sheep might encounter. He also has a staff which he uses to gently prod and guide his flock in the right direction. If we make Jesus the shepherd of our lives, then we too can draw great comfort from his presence as our protector and guide. 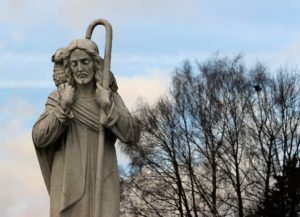 As a shepherd, David knew that there might be times when leading his sheep when he would be forced to put his life on the line to protect his flock. Whilst looking after his father’s sheep, David had to fight off lions and bears. Psalm 23 may just be six short verses, but I have found it to be an incredibly rich source of inspiration, instruction and guidance. I have hardly been able to scratch the surface of its depth this evening. I hope, however, that David’s words have inspired you to consider the extent to which you know that leadership of the Good Shepherd, Jesus Christ, in your own lives. I hope that having seen how the Shepherd God provides for us, restores us, and protects and guides us, you have been challenged to become more sheep-like in your relationship with Jesus Christ. This entry was posted in Audio, Talks/Sermons and tagged Psalms. Bookmark the permalink.